This is the first-ever monograph on Verona-born architect Armando Ronca (1901–70), a significant protagonist of Italy’s post-war Modernism. Following his studies in engineering in Genoa, Torino, and Padova he started working as an architect in Trento before he established his own studio in Bolzano in 1935. Ronca soon became a leading proponent of Modernism in architecture in Northern Italy. In 1944, he opened a second studio in Milano, where the 1948 expansion of the San Siro football stadium in collaboration with the structural engineer Feruccio Calzolari was the largest single project of his entire career. 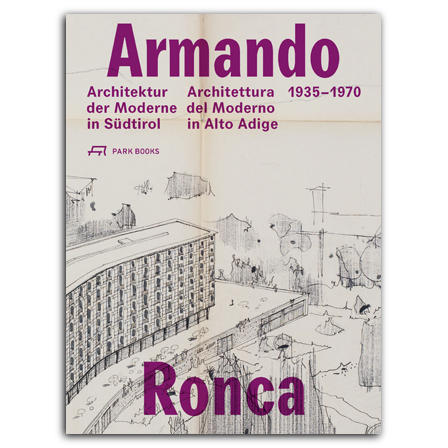 This new book documents Ronca’s life and work, featuring in detail some forty of his designs mainly in the Trentino-Alto Adige and Lombardy regions, richly illustrated with original plans and drawings by Ronca and period photographs. Newly commissioned images by Austrian architecture photographer Werner Feiersinger present all of Ronca’s preserved buildings in their current state. Essays by Andreas Kofler, Massimo Martignoni, Giorgio Mezzalira, Magdalene Schmidt, Luigi Scolari, and Jörg Stabenow, and a complete catalog of Ronca’s built and unrealized projects and interior designs round out the book.